Living Liberty draws huddled masses to trade show exhibits! Planning on attending a trade show and wondering how to draw attention to your booth? 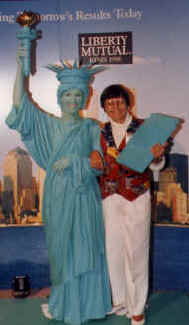 Hire Living Liberty for photo-ops, and watch the masses flock to your booth's teeming shores! Living Liberty� is the registered trademark of Jennifer Stewart. All rights reserved.